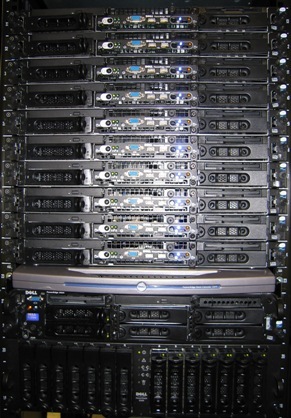 The VLab is a cluster of powerful server computers, a fast network, and a large storage system that is dedicated to education in experimental computer systems and networks. It serves the needs of undergraduates, graduate students, and faculty in EECS in that capacity. The VLab is a unique resource because it runs virtualization software, specifically VMware Virtual Server, that makes it possible to create virtual computers (also known as virtual machines or VMs) that are equivalent to physical computers. A single VLab computer can support many VMs, each of which can run almost any OS, including Linux, Windows, Solaris, FreeBSD, NetBSD, and QNX. Undergraduates, graduate students, and faculty can create their own private or public VMs on which they have full root and console privileges. The VLab is generously funded by a Murphy Society grant to NSRG. Do I need a VLab account? You only need a VLab account if you want to create or manage your own VMs. Accounts within an individual VM are handled by its owner. Should I get a VLab account to log into a VLab server to do my homework/research? Directly using the VLab servers is strongly discouraged and will be stopped. The purpose of the VLab is to run VMs. The owner of a VM can do as he pleases within it. The real question is Do I need my own VM(s) to support experimental computer systems education or related areas? A description of why you need an account. A rough estimate of how much memory and disk space the VMs you're planning to create will require. You should also cc your sponsor. You'll receive a response message describing the account and password. Do nothing illegal or suspicious with your VM. The VLab is not a general purpose resource. It's here to support experimental computer systems education and related areas. Use other resources for other purposes. Power down or suspend VMs that you do not to leave running at the moment. Select VLab servers for new VMs randomly to avoid putting excessive load on any one server. Delete VMs you are no longer using. Work with r o o t at e e c s . n o r t h w e s t e r n . e d u to acquire a valid and appropriate IP address for any VM with bridged networking. Alert r o o t at e e c s . n o r t h w e s t e r n . e d u of major changes in resource usage. Consider contributing hardware resources to the VLab. We can use high quality rack-mount servers, memory for the same, and SCSI hard drives. If we notice what seems to be unreasonable use of the VLab, we will investigate and likely ask you to comply by deleting VMs or suspending your account. If the reasonable person principle does not work out for the VLab, we'll institute quotas and all the rest of that painful stuff. How do I create and manage VMs now that I have an account? The next page describes how to create a VM and install your operating system of choice on it.